I have posted photos of the cycler machine that I use to accomplish nightly peritoneal dialysis. The other, and more commonly known type of dialysis is hemodialysis, generally accomplished in a clinic, although home hemodialysis is also an option. For today’s post, I will present some information on these two main types of dialysis. For more information, please go the Kidney Foundation of Canada website. Hooked up to the hemodialysis machine. Blood vessels are accessed through the arm, neck or as in this case, the chest. Hemodialysis means “cleaning the blood” and that’s exactly what this treatment does. Blood is withdrawn from the body by a machine and passed through an artificial kidney called a dialyzer. There are several different kinds of dialysis machines, but they work in almost the same way. A dialyzer (artificial kidney) is attached to the machine. The dialyzer has two spaces: a space for blood and a space for dialysis fluid. Dialysis fluid is a special liquid which helps remove waste products from the blood. The two spaces in the dialyzer are separated from each other by a very thin artificial membrane. Blood passes on one side of the membrane and the dialysis fluid passes on the other side. 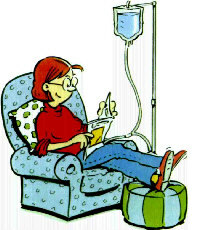 Each hemodialysis treatment normally takes four to five hours. Some people call a treatment a “run”. Usually, you need three treatments (or “runs”) a week. However, certain people may need more frequent treatments or longer treatments. Sometimes shorter treatments are sufficient. Hemodialysis is done in a hospital dialysis unit where nurses, nephrologists and other medical support staff are available. Once a patient on hemodialysis is stable, it may be possible to have hemodialysis treatments in a clinic away from the hospital, in a self-care centre (with some help from the staff), or at home. Special training is needed for self-care or home hemodialysis. Not all types of treatment are available in all communities. 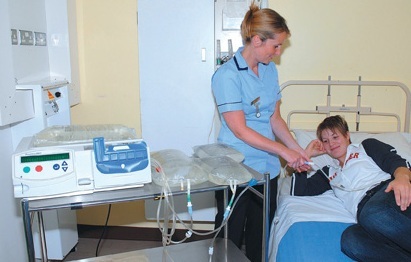 A young patient getting trained on peritoneal dialysis using the cycler. The cycler changes the fluid over the course of several cycles at night while you sleep. Continuous Ambulatory Peritoneal Dialysis. Fluid is changed periodically during the day. Peritoneal dialysis is another form of dialysis used to remove waste products and excess water. It works on the same principle as hemodialysis, but your blood is cleaned while still inside your body rather than in a machine. In peritoneal dialysis, the inside of your abdomen—your peritoneal cavity—is filled with a special dialysis fluid that looks like water. This exposes blood vessels in the peritoneum to the fluid. The peritoneum functions just like the artificial membrane in a dialyzer. Excess water and wastes pass from the blood through the peritoneum into the dialysis fluid. The fluid is then drained from your body and discarded, and the process is repeated four to six times in every 24-hour period. In peritoneal dialysis you always have dialysis fluid in your peritoneal cavity, so your blood is constantly being cleaned. The fluid is changed at regular intervals throughout the day. Dialysis fluid enters the peritoneal cavity through a tube called a catheter. The catheter is surgically inserted in your abdomen, usually below and to one side of your navel and stays there as long as you are using this form of dialysis. The insertion of the catheter may cause discomfort for a brief period, but peritoneal dialysis is not painful. However, care must be taken to avoid infection. 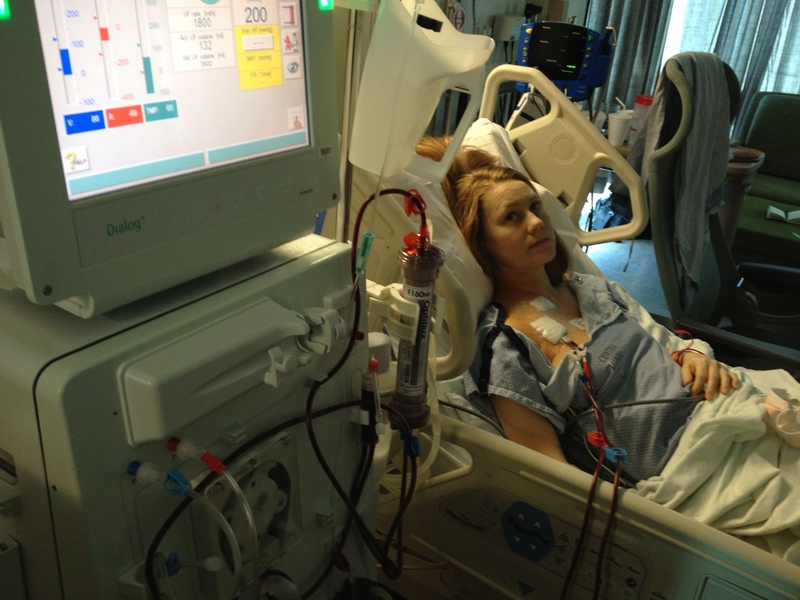 This entry was posted in Uncategorized and tagged dialysis, hemodialysis, How do I save a life?, kidney disease, kidney donation, kidney for russ, kidneyforruss, organ donation, organs, peritoneal dialysis on November 5, 2014 by kidneyforruss.